These four children were playing in the sand pile, which was used to make cement and mortar, at the construction site. Zoom up on the picture and you will be able see the scaffolding and the outline of the building behind. 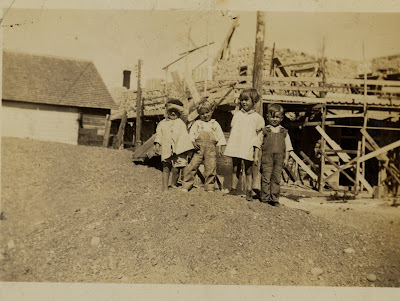 The children all lived within two blocks of the construction site. Left to right: Betty Bolin, Duane Augdahl, Ardyce Anderson and Eugene Stene. Ardyce Anderson's father was Gust Anderson, the foreman of building project.